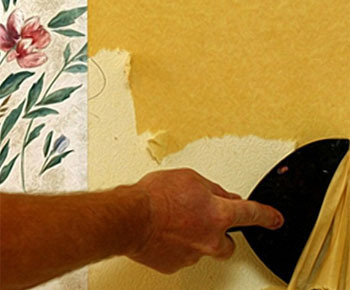 An exact quote is provided to you for stripping and removing your wallpaper. Furniture is moved away from the walls and covered in plastic prior to the stripping and removal of your wallpaper. Absorbable drop cloths are laid down to catch excess wallpaper stripping solution while removing your wallpaper, backing and glue. Several different enzyme solutions and techniques are used to strip and remove the wallpaper, backing, and glue. We also have 4 steamers on hand for those really stubborn wallpaper removal and stripping jobs. Special sealers are applied to the walls after the wallpaper is stripped and removed to prepare the surface for repairs, paint, or the rehanging of new wallpaper. Drywall repairs are made if necessary and spot primed with a quality primer. on wallpaper removal or installation.